The City of Cockburn held its first annual World Food and Music Festival. The event was held by the non profit group the Cockburn Central Town Centre Association (CCTA), in which was a free family event. The event featured a variety of cultural attractions such as Spanish flamenco dancers, local bands, and of course the Chinese Lion Dance performed by the Chinese Community Centre (CCC) Lion Dance Troupe. The event also featured many different types of cultural food trucks. The CCC Lion Dance Troupe performed a 5 lion dance performance for the large audience. The 5 lions commenced the performance at the front of the stage and displayed a variety of jumps and percussions. The Lions then went into the audience and interacted with all the families who were enjoying this wonderful event. The performance was definitely one that was enjoyed by all. The CCC Lion Dance Troupe would like to thank CCTA for not only having us at this event, but also in organizing this event overall and putting an unique event for the Cockburn Community. We hope to be back next year! To celebrate Harmony week, The Australian Asian Association hosted its Multicultural food fair at Hyde Park. The event featured many traditional cuisines, various cultural dances and songs, and other fun activities for the children. The Chinese Community Centre (CCC) Lion Dance Troupe commenced the event by performing the traditional Chinese Lion Dance. The lions began the performance on the stage displaying a number of aerial movements before going into the audience and blessing all those around at the event. The performance finished with a loud applause from the audience, a great sign showing the performance was well enjoyed. The CCC Lion Dance Troupe would like to thank the Australian Asian Association for having us at this meaningful event. The annual Global Beats Festival was held again this year, but at the new location at Paloma Park in Marangaroo. 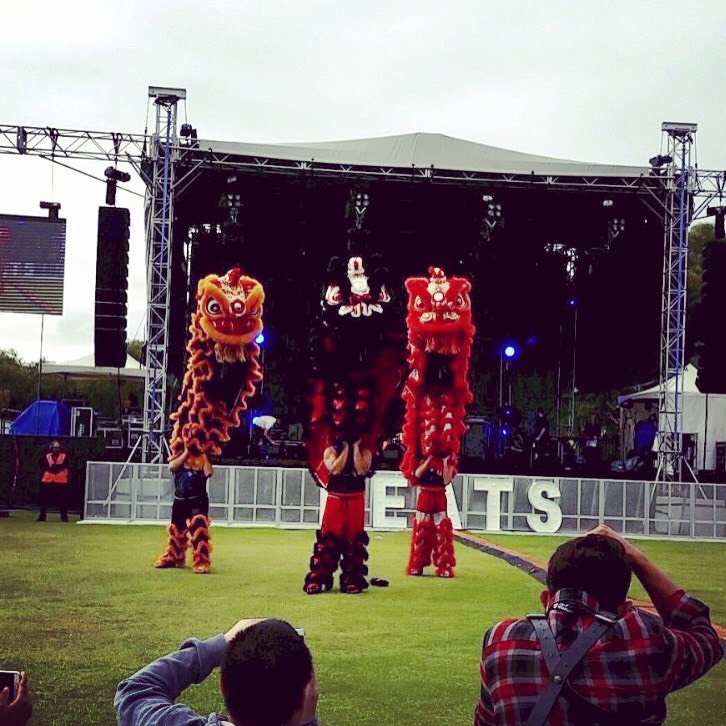 The Festival featured many different acts such as Chinese Lion Dancing, Hula Magic, Rio Dancing, as well as featured music from upcoming Australian bands. To add on to the diverse culture of the event, a number of international food trucks/stalls was also available. The Chinese Community Centre Lion Dance troupe lion dance performance had its lions roam the grounds of the festival interacting with the audience bringing good fortune to all those around. In addition the lions displayed a number of aerial displays and live percussion. Given the great turn out, the festival was a great success! 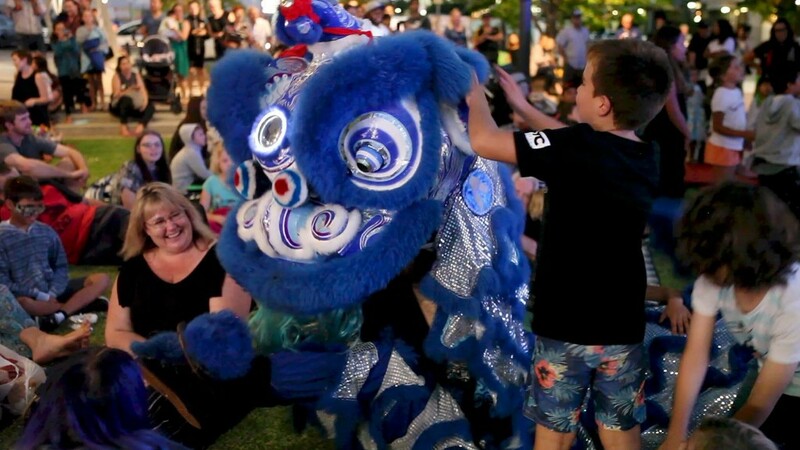 The Chinese Community Centre Lion Dance Troupe would love to thank the City of Wanneroo for having us perform at this great event and also organizing such a festive event for the community. 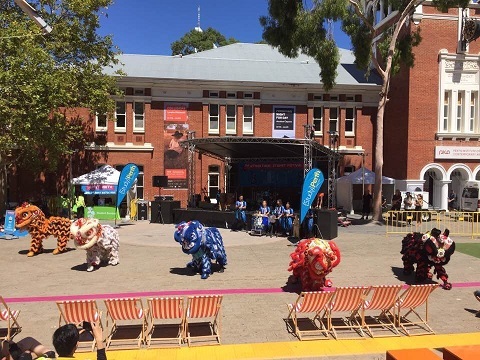 To mark the start of the Perth Student Festival, the CCC Lion Dance troupe once again performed at the event to start off the festivals activities. The festival featured many university booths offering information to students, as well as food stalls and activity booths. The 5 lions started its performance with a display of acrobatic jumps and then moved into the crowd and interacting with all the students present at the event. After the performance, the students all embarked on their amazing race run. We would like to thank the organisers of the event for yet having us again for another year. We look forward to the next year performance. The CCC Lion Dance Troupe had the great pleasure to perform at the wedding of Shu and Dipesh. The ceremony was held at the elegant Bar Laffette. When the ceremony began, the bridal party was introduced first. And when the bride and groom were introduced, the loud musical instruments played and the 3 lions escorted the newly weds down to the venue giving them the grand entrance. The lions interacted with the guests at the wedding, in which guests fed the lions lucky red packets. The lions then presented a goodluck scroll to the newly weds in blessing them in their union together. 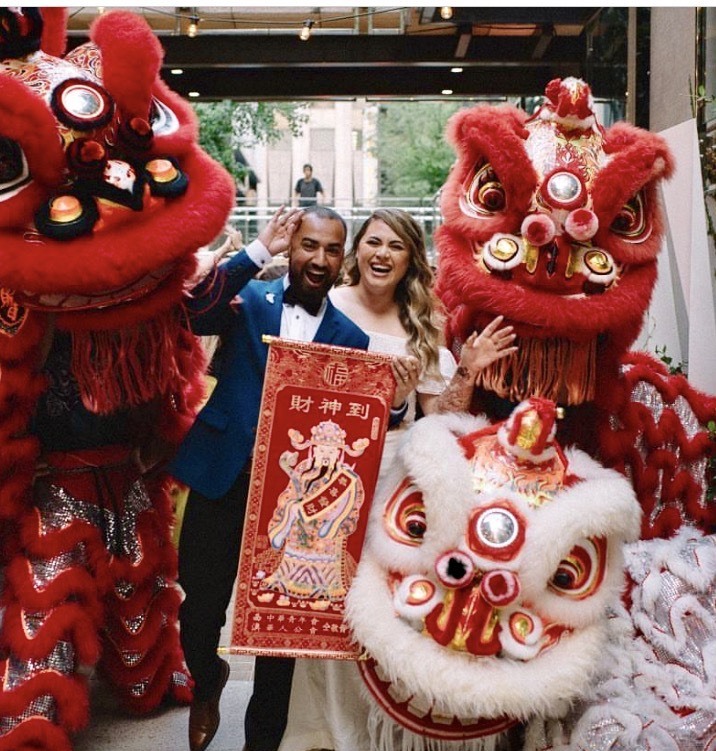 From all of us at the CCC Lion Dance Troupe we would love to wish Shu and Dipesh all the best in their new lives together. Thank you so much for allowing us to be part of this special day.